Confessions of a Twenty Something Artist: Have you Heard the News? Kelly Purkey is coming to St. John's, Newfoundland in March and I, along with many others, couldn't be more excited about it! 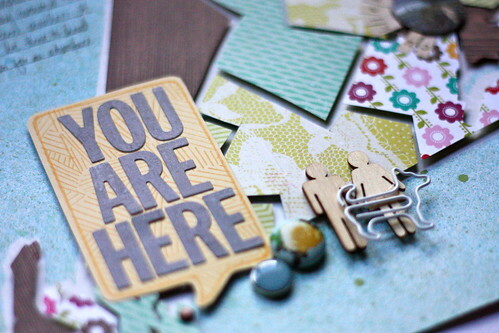 The news went live yesterday on The Paperie's blog. You can check it all out here if you didn't see the big announcement. 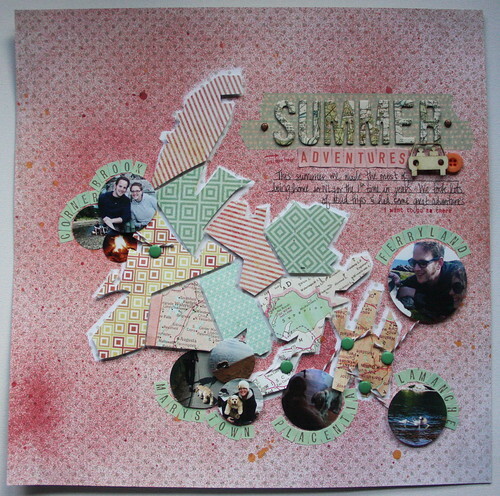 In honour of today's exciting news I thought I'd share a few layouts that I made for The Paperie's retreat in November. I know, I know-it's a bit late but I forgot all about them until now. They were inspired by Kelly Purkey-I basically borrowed her idea entirely and created maps out of pattern paper, misting along the way to create a really cool dimentional effect. 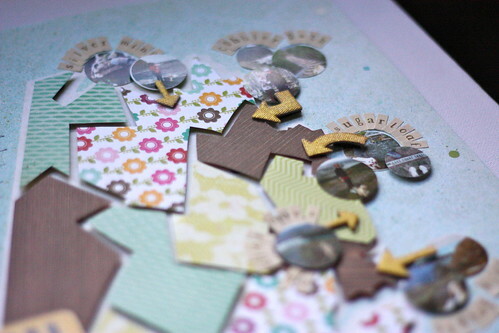 Check out her layout and tutorial here. This was the layout that I showed the crowd, demoing the map concept. We did a lot of traveling this summer all over Newfoundland and this was the perfect way to chronicle all of our travels. Just a few little photos cropped into circles. I identified the locations with brads and used twine to 'point' to the pictures. I also used some wood veneer people and a little car-I even cut the legs off the people and stuck them in the car as a 'road trip' embellishment. I mean, how stinkin' cute does that look?! And this was the one I 'made' during the demo. 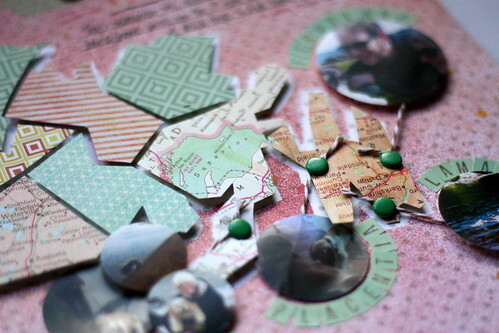 Just a note, but it's always a good idea to have a great story while you fussy cut a million pieces of paper. Just sayin'. This one chronicles all of the East Coast trail hikes we did this past Fall. We had a blast exploring with Eugene and managed to fit in lots of trails before the cold weather kicked in! Similar idea here with the circles but changed it up by using a tiny Newfoundland map (bottom left hand corner) and focusing on one area-like in the maps that you see where one area is zoomed in and then it says 'you are here'-hence the title! 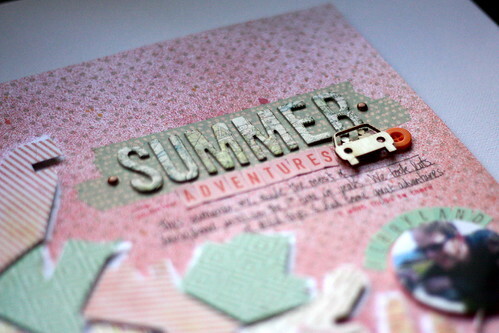 This puppy dog paperclip from Amy Tangerine was perfect with the little people wood veneers as an embellishment. I used arrows, painted with some gold paint to identify the different trail. Stuck with photos cropped in circles and little letters around the circles-same as the one above. I LOVE this idea. I think I'm going to frame these two and add one more to it- a NYC one with some landmarks from our trip this past November- and put them up in the scrapbooking room. This technique is a time-consuming one but well-worth it in my opinion! Try it out. And if you're local you should call The Paperie to sign up for an awesome weekend of fun with Ms. KP herself in March. I can't wait to see what she's going to share with us! Love this LO and the technique! Can't wait to see KP in March.So excited! We are going to have an awesome weekend! Cool technique and great pages! I really like these fun layouts! Very cool! These are some very cool LO's! Love, love, love this idea! Thanks for sharing it. OH MY WORD!, these are fantastic! Fantastic pages to look at...amazing detail! I love your layouts and that car is too cute. OH. MY. These layouts are AMAZING! 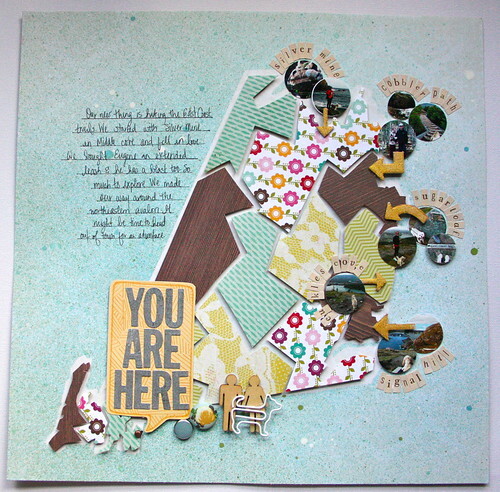 I'm totally stealing your Newfoundland layouts and making one for me! love, love love it!